Last week, Voices of Strength: Contemporary Dance & Theater by Women from Africa (Program A) opened New York Live Arts’ second season with two works: Correspondances by Kettly Noël (Haiti/Mali) & Nelisiwe Xaba (South Africa) and Quartiers Libres by Nadia Beugré (Cote d’Ivoire). Program A (and a Program B that I was not able to attend) are part of a MAPP International Productions mini-festival and tour. A couple weeks ago, I spoke with Cathy Zimmerman about the development of the project. Many years in the making, it began, in part, due to Ralph Lemon’s Geography project, which brought Cathy and others into regular conversations with working African artists and has since spawned the development of The African Contemporary Arts Consortium (TACAC), a collection of organizations including MAPP, The Bates Dance Festival, Center for World Arts at the University of Florida, the Walker Art Center in Minneapolis, Yerba Buena Center in San Francisco, Seattle Theater Group, the Kennedy Center, 651 Arts, VSA Arts of New Mexico/North Fourth Art Center, and the National Black Arts Festival in Atlanta focused on developing “a dynamic exchange of arts and ideas between artists, arts organizations and public communities” across the US and the African continent. The progression of the project has included festival viewings in Europe and Africa, regular exchanges with the artists that included immersions in the artists’ home communities and a production residency at KVS in Brussels, at which many of the Voices of Strength artists met one another for the first time. because the performers were women from Africa, the pieces would involve tribal music, vibrantly colored costumes and soulful, polyrhythmic movements of multiple body parts. I came with expectations that there would be an “African” feel to the pieces and I fault myself for connecting the word women and Africa into one idea. What I saw on the stage were three women. Did they represent Africa? Maybe. This evening was about woman regardless of culture, race or ethnicity and was summed up by Kettly Noel in Correspondences when she says “I am a global woman.” Being African clearly informs these performers but it was not the dominant aesthetic guiding their performances. Imagine expecting American artists to work on thematic elements of frontier-ism or to incorporate clogging or, for that matter, the aesthetics of the Wampanoag. “Africa” and “African” are no more static as signifiers than any other should be, but it’s been easy to remain ignorant to the sophistication of artists from this continent, despite the rapid growth that can be easily quantified in the IMF’s projection for it as the fastest growing economy of any continent in the next five years. The concerns for these artists run parallel to any American artist working under the constant duress of systems enforcing continued economic and social exclusions. However, where I sometimes feel submerged in the growing tide of a disenfranchised dance community, the women on stage Wednesday night have channeled their aesthetic and socio-political struggles into a kind of potent, sometimes whimsical (though often biting) form of suffrage. The Voices of Strength project creates a platform for accurate representation for these artists. They don’t have to speak for ALL women from ALL of Africa, or even their countries of origin. But, it was clear from Xaba’s first uber-couture entrance and Noel’s endless, air kissing of the audience in the early parts of Correspondances that these savvy women can claim cultural omnivorism (read, the new elite) with haughty ease. And, that, in chatting about seemingly frivolous concerns (fashion, appearance, money) before an eventual onslaught of graphic imagery, they revealed themselves as full-fledged delegates in a very contemporary arena. Meanwhile, Beugré’s eviscerating Quartiers Libres is all active voice, even in its more reflective moments. Her performance is wrought in the fires of imperialism and she burned through her exhaustive solo with a scalding fervor that incited many a jaded New Yorker off their asses (and to our feet) at its conclusion. In fact, at one point, members of the staid, critical community could easily be heard whooping and bursting into applause from the sheer, visceral contact high. These works were full of wit and pathos. And, yes, okay… their voices were strong, but also eloquent, considered and gloriously unrelenting. …themes confronting personal freedom, risk taking (as displayed both on and off the stage), as well as the need to subvert and expand cultural expectations were the driving force for what became an intensely complex dialogue. 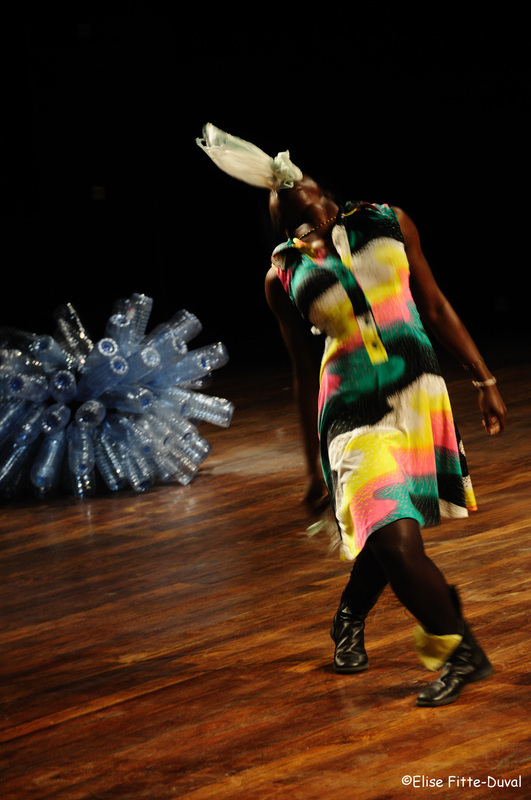 While no finite answers were found, it’s clear that the presence of these contemporary female artists (and numerous others who create work on the African continent) in the global discourse of live performance has given birth to a new African aesthetic that is deeply rooted in African traditions while not being restricted by them. These women push against the categorical, the definable, and the easily classified.